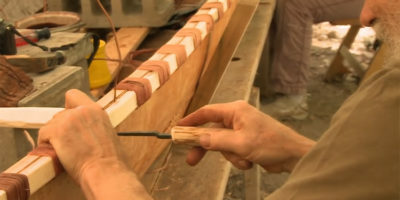 A short film that shows a gentler, more relaxed aspect to Green wood working. The making of a traditional Post and Rung Stool is shown from the selection of the tree and preparation of the wood to the construction of a charming little stool. Although the wood workers, Tom Bonamici and Derek Lasher, make it look easy, there is a substantial amount of skill and experience that goes into such craftsmanship. It is obvious that they take great pride in their work.